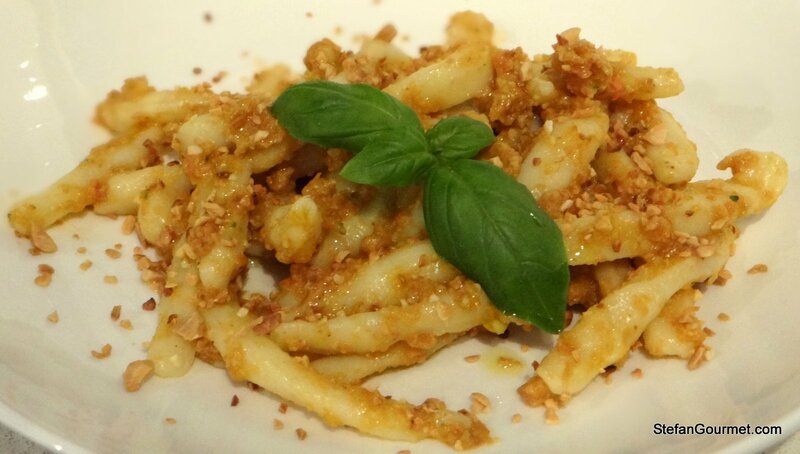 Each region in Italy has its own pasta shape, and in western Sicily around Trapani this is busiate. Like other fresh pasta from the south of Italy it is made from durum wheat flour (semola di grano duro rimacinato) and water only, no eggs. Although it is also available dried, busiate are best when freshly made. 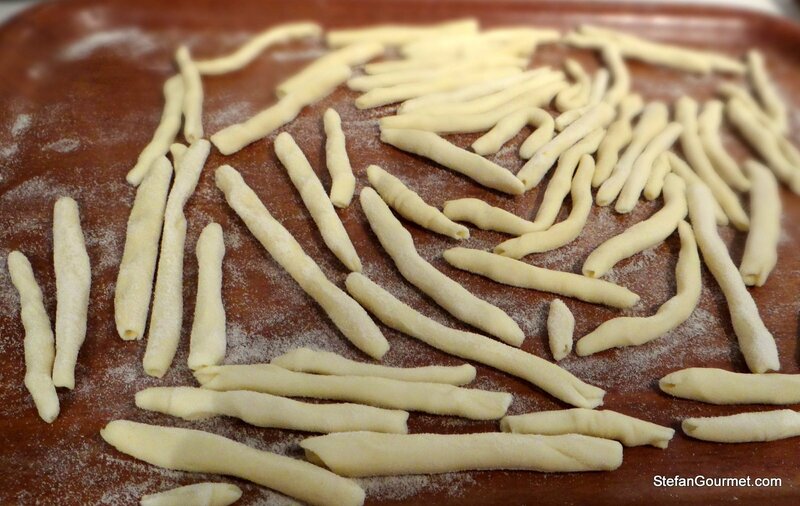 Homemade busiate are thin hollow tubes of pasta, about 7 cm (3″) in length and with a diameter of about 4 mm (1/6″). Fancier types have the same dimensions, but resemble telephone cord. The first time I’ve ever tried busiate was at a great trattoria called U Sfizziusu in San Vito Lo Capo, a beach town close to Trapani. There I had Busiate alla Trapanese, busiate with Pesto alla Trapanese. Trapani and Genova are both port towns, and interaction between the two has introduced the concept of pesto from Genova to Trapani. Pesto alla Genovese is made with basil and pine nuts, whereas the principal ingredients of pesto alla trapanese are tomatoes and almonds. Whereas there exists an official recipe for Pesto alla Genovese, this is clearly not the case for pesto alla trapanese. Tomatoes, almonds, and garlic are in all of them. I’ve encountered version with our without (Sicilian) pecorino cheese, whereas thanks to a post by Chef Mimi I found out that Nigella Lawson even adds capers, raisins, anchovies, and chile pepper. I decided to make it as I remember it from U Sfizziusu: with minimal ingredients but great flavor nonetheless. I only left out the eggplant, because I was already serving caponata as part of the same dinner. The only caveat with any pesto alla trapanese is that you need good tomatoes as they are used raw. Tomatoes available around here are often watery, which is less of a problem when making a sauce because you can easily use a larger amount of tomatoes and cook them down a bit more to concentrate the flavors. 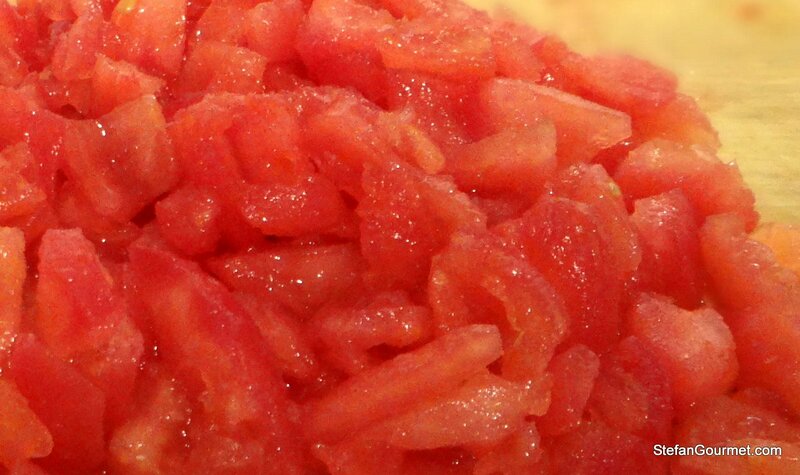 In this recipe that is not possible, so it’s probably best to make this in summer only when flavorful ripe tomatoes are available. Start by making the busiate. 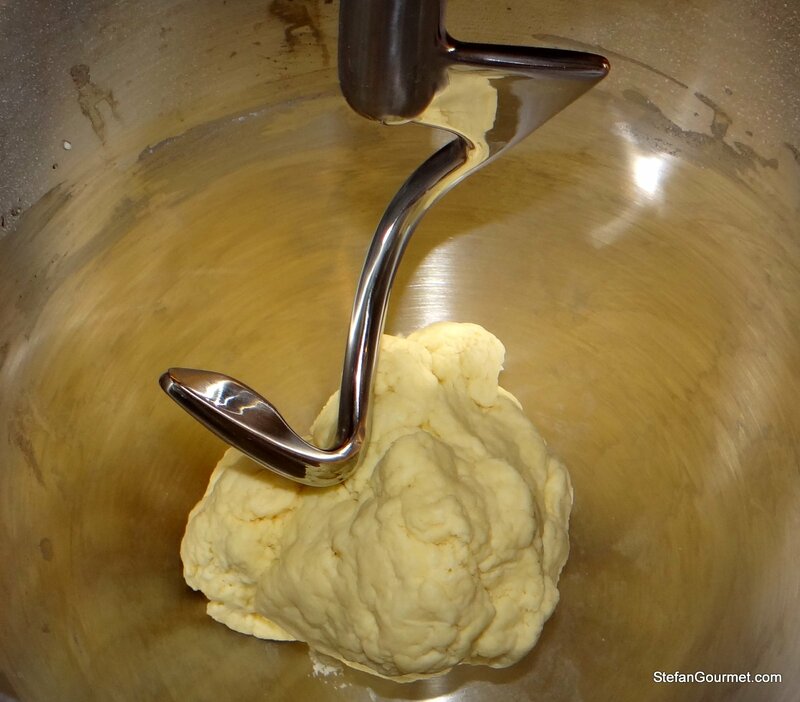 You can make the dough by hand, but if you own a stand mixer that is much easier. 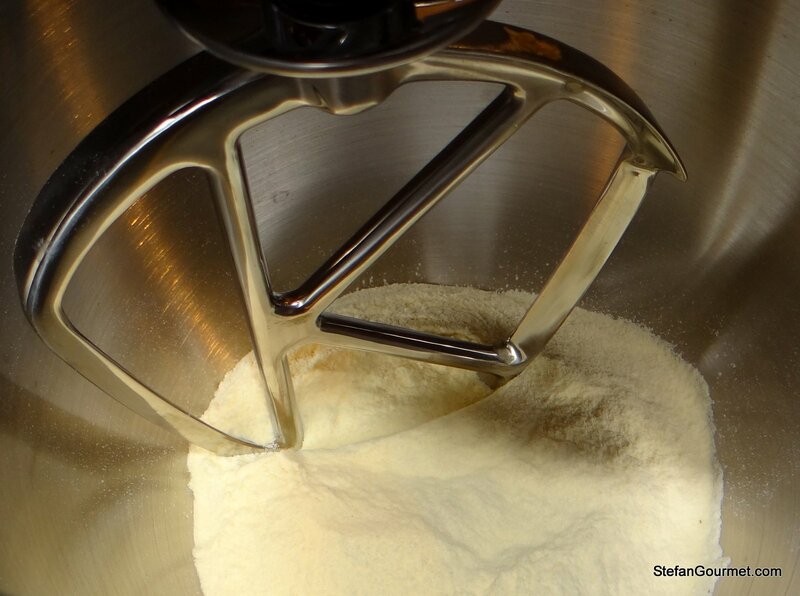 Put the flour in the bowl of the stand mixer fitted with the paddle attachment. With the machine running on medium speed, slowly add water. The exact amount of water depends on the humidity of the flour. You should only add barely enough to make the dough come together. Especially towards the end, you should only add a few drops at a time. If the dough becomes too sticky anyway, you can add a bit of flour. Change over to the dough hook. Knead for 5-10 minutes until the dough is smooth and elastic. 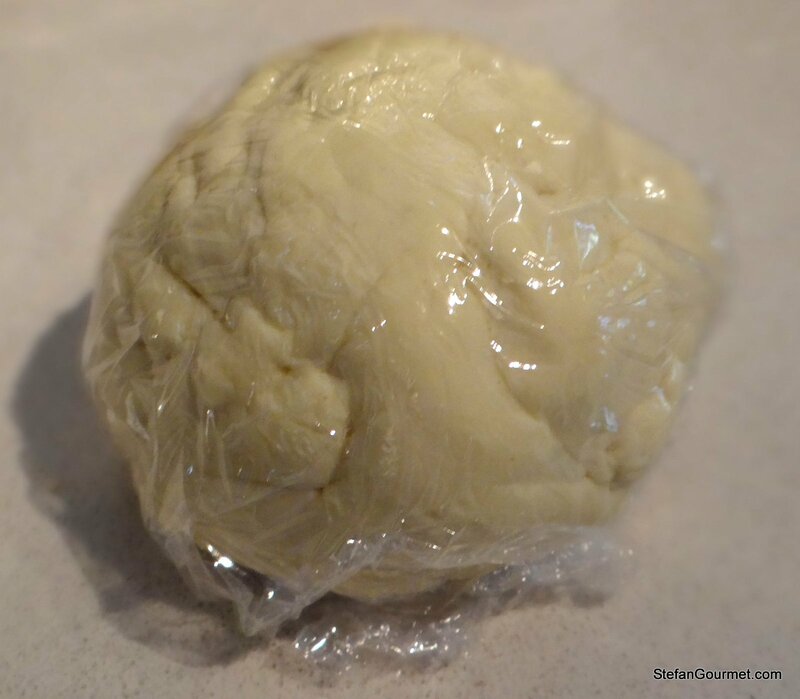 Cover the dough in plastic wrap and allow it to rest in the refrigerator for half an hour. When you are ready to shape the busiate, take a piece of dough and roll it into a thin long cylinder with your hands on a wooden work surface. (Rolling out dough on wood is much easier than on another work surface like granite.) The exact diameter of the cylinder is not very important: if it is a bit thicker, you just need to cut shorter pieces off of it. Cut the cylinder into pieces of about 3.5 cm (1 1/2 inch). 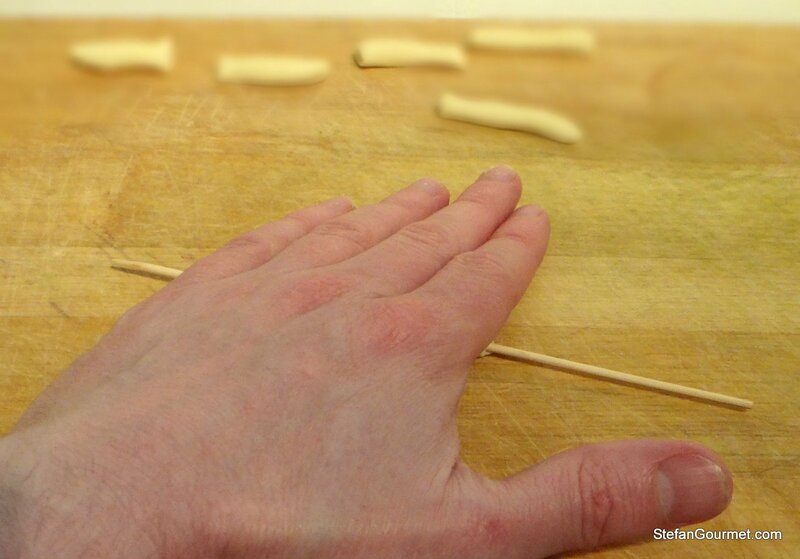 Press a wooden or metal skewer lengthwise onto the piece of dough. 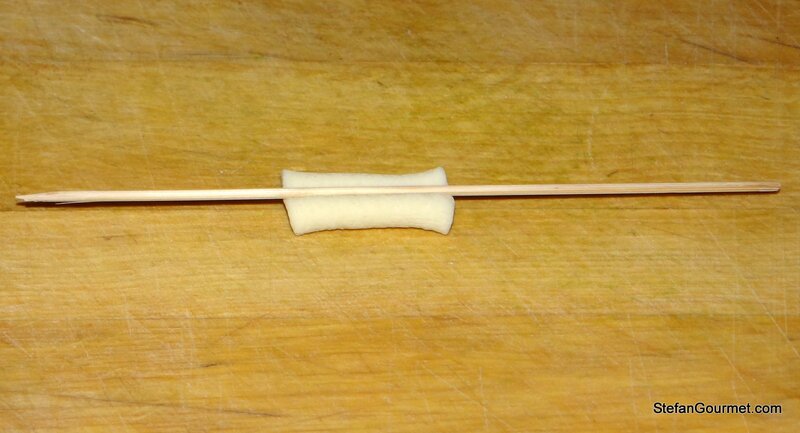 …until there is a thin cylinder of dough wrapped around the skewer. 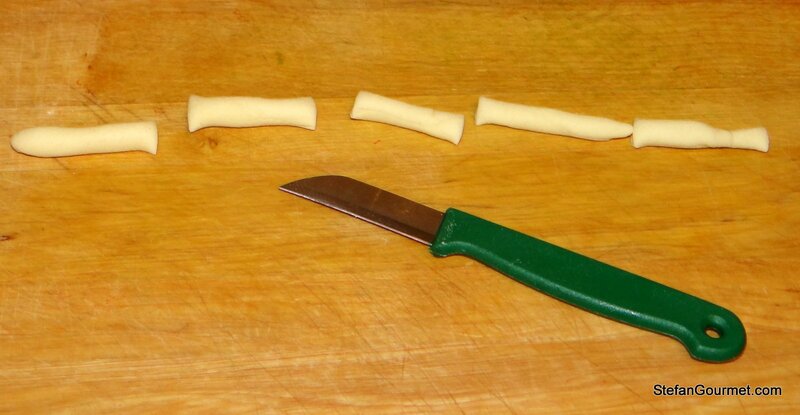 It should be about 7 cm (3″) long, if it is longer you can roll out the cylinder of dough more thinly or cut shorter pieces off of it. 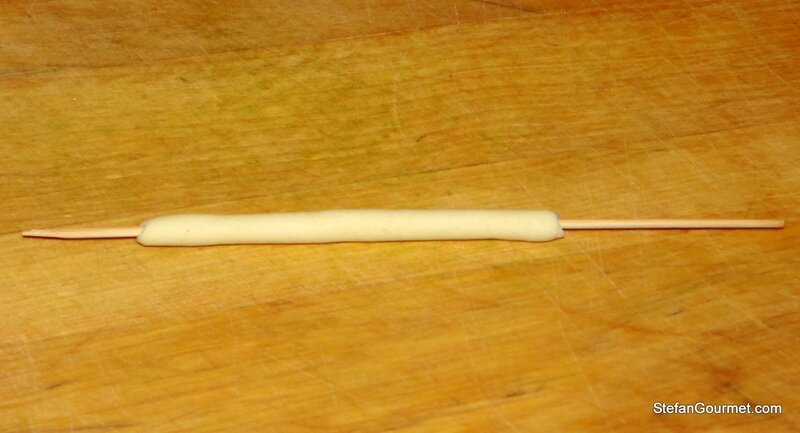 Slide the busiata off the skewer and put it on a floured tray. 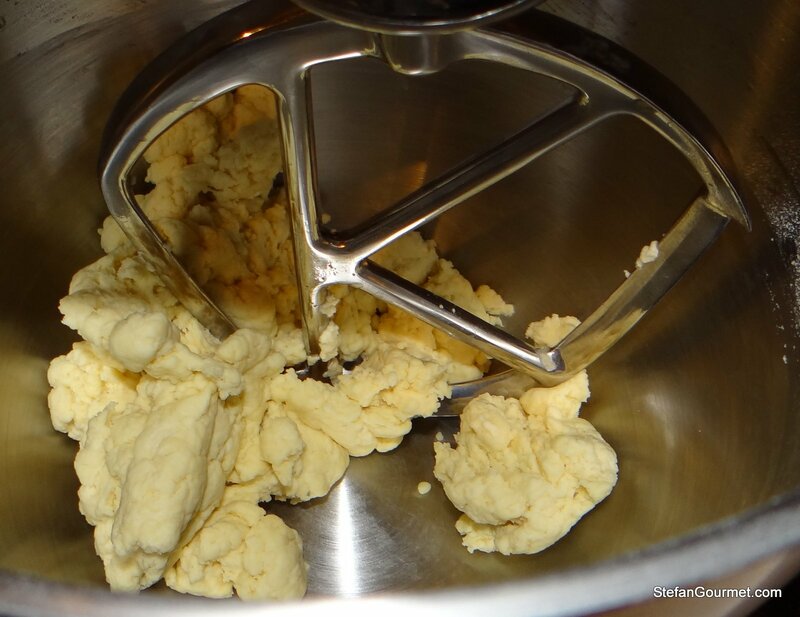 Repeat until you have used up all of the dough, arranging the busiate in a single layer on the floured tray. Allow the busiate to dry for a bit. To make the pesto alla trapanese, start by toasting the almonds for 10 minutes in the oven preheated at 180C/350F. Meanwhile, remove the skin and seeds from the tomatoes. You can read how to do that in this post. Chop the tomatoes. 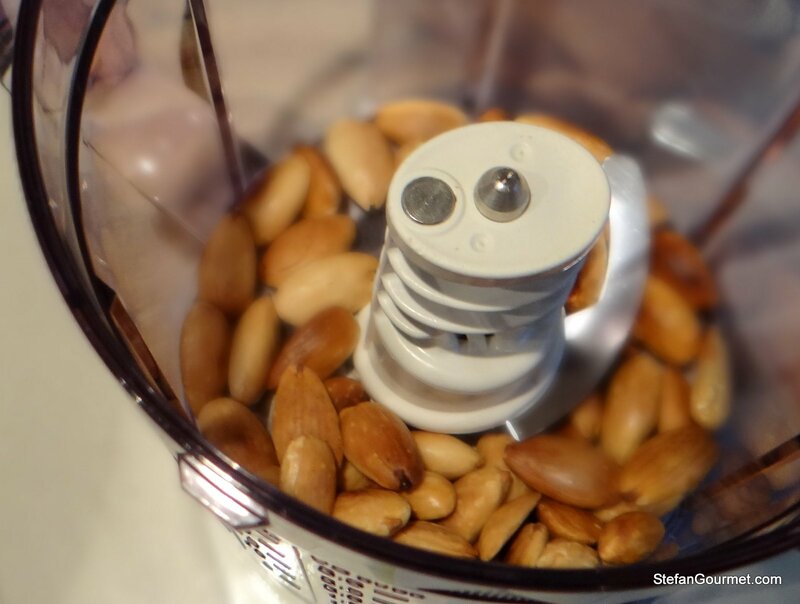 Chop the almonds in a blender or food processor, or with a chef’s knife. Reserve about 1/4 of the chopped almonds (the coarser bits) for garnish. 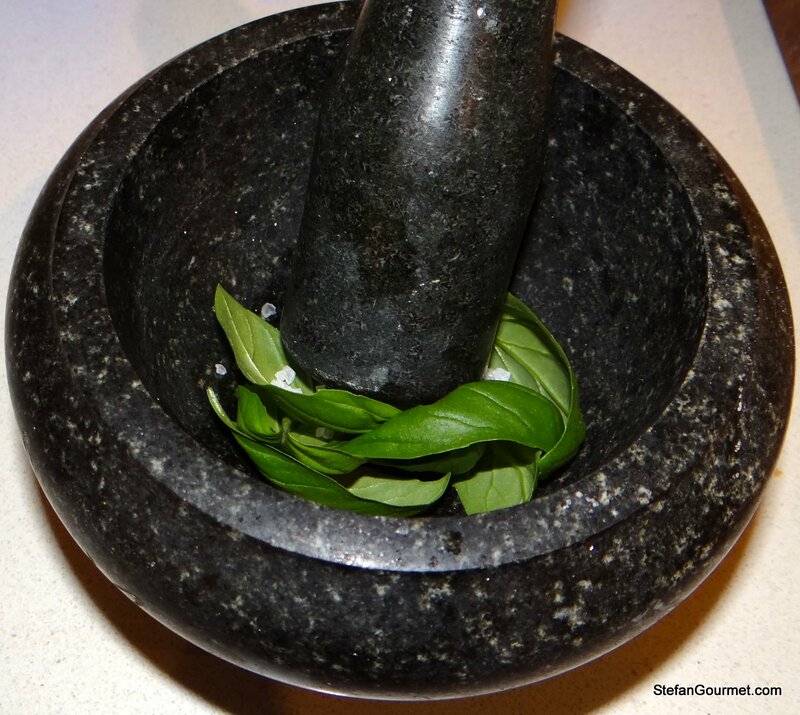 You can continue to make the pesto in the blender or food processor, or move over to pestle and mortar. Start with the basil and some salt. 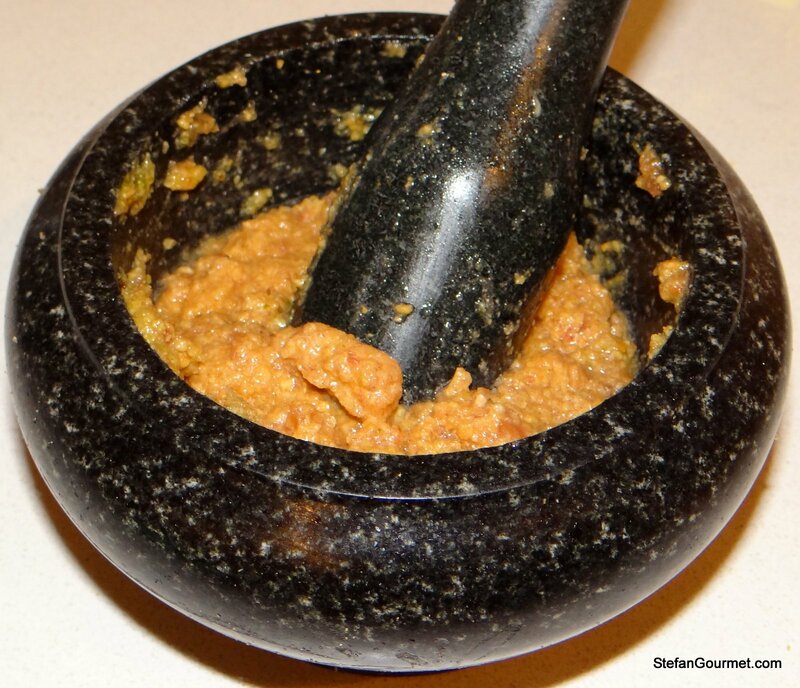 Use the pestle and mortar to reduce this to a smooth paste. 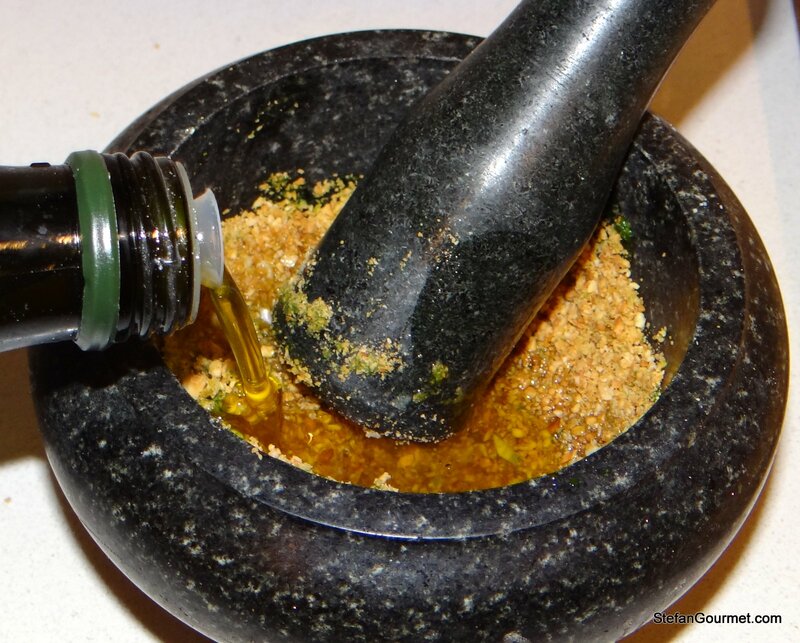 Add chopped garlic, chopped almonds, and some olive oil, and process it to a coarse paste. 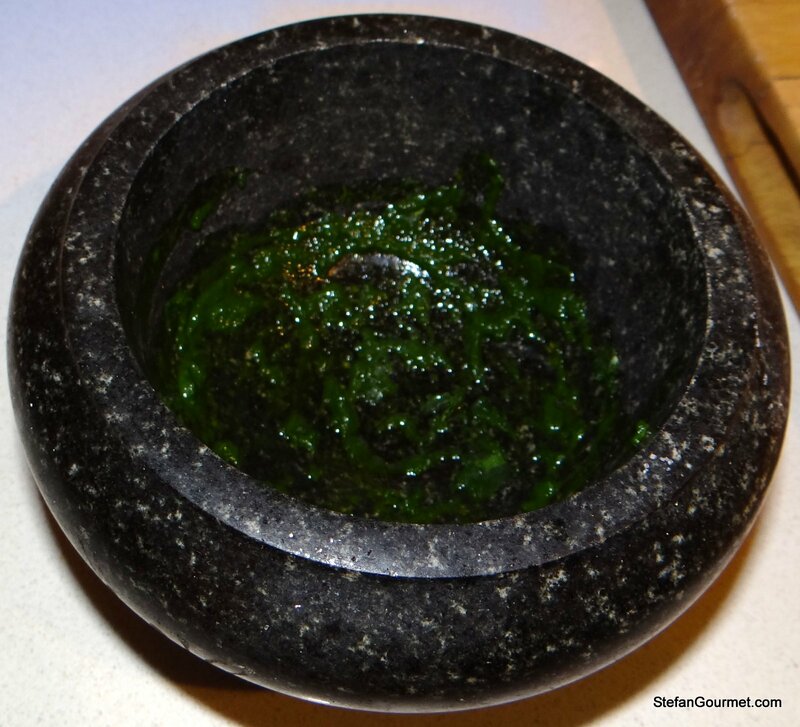 The pesto is done when it has a slightly coarse consistency. You could also make it the day before and allow to flavors to develop in the refrigerator. Boil the busiate in ample salted water until al dente, about 8 minutes. Start tasting the busiate for doneness after 6 minutes or so. Heat up a wide non-stick frying pan over low heat and add the drained busiate and the pesto alla trapanese. Toss to mix. 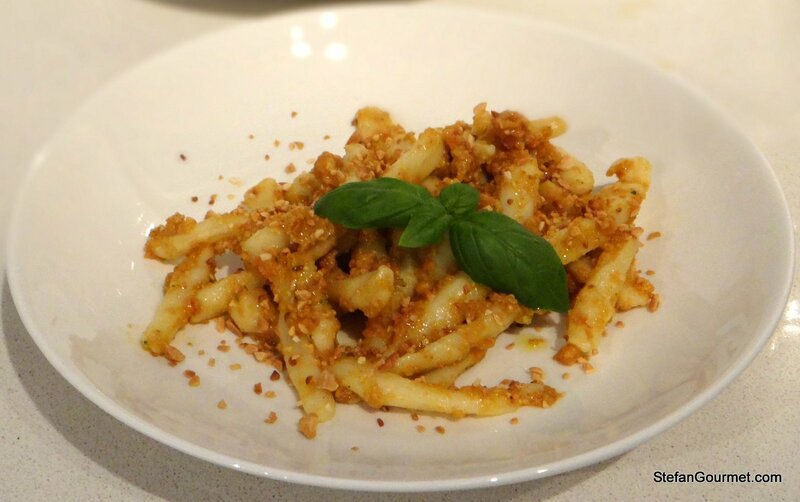 Serve on warm plates, sprinkled with the reserved chopped almonds and some basil. You could also add some freshly ground black pepper if you like. This is good with many dry Italian whites, as many of them have bitter notes of almond (which goes well with the almonds) and fruity notes (which go well with the tomatoes). I like the past forming technique. I wonder if only watery supermarket tomatoes are available if you could maybe slice sun-dry them for an afternoon, or perhaps put them in a very low oven for several hours so that they concentrate the flavors without cooking? You could do that and it may certainly turn out nice. I think it will be difficult to retain the flavor of ‘fresh’ tomatoes though. I was wondering what other uses my surplus of bamboo skewers would serve: this certainly can be one of them. 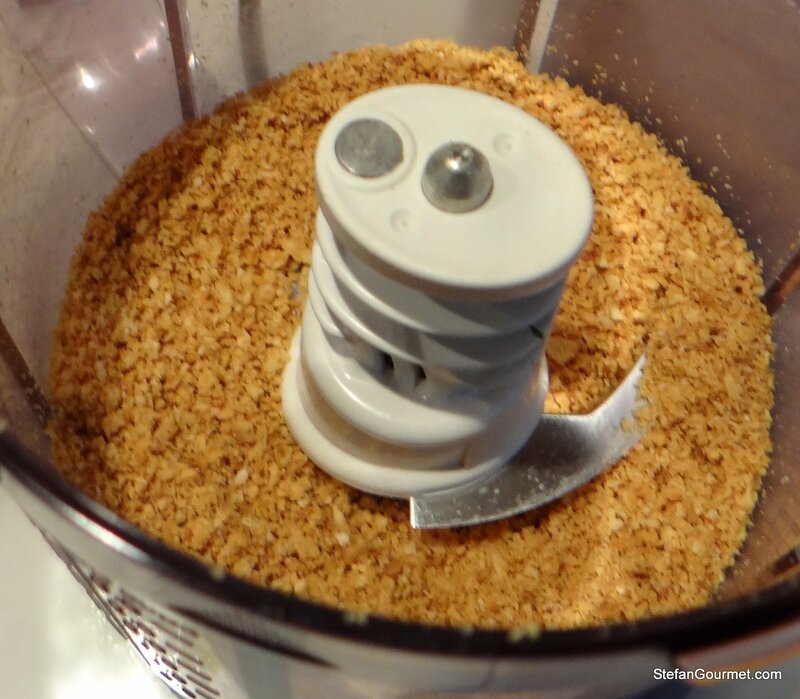 At first glance I thought that you had made bread crumbs in the food processor to toss over the busiate. (That’s what I get for looking at the pretty pictures first before reading your blog.) I bet the crunch of the nuts along with the plush pasta and sauce make for a good mouthfeel let alone a wonderful marriage of flavors. Yummy. 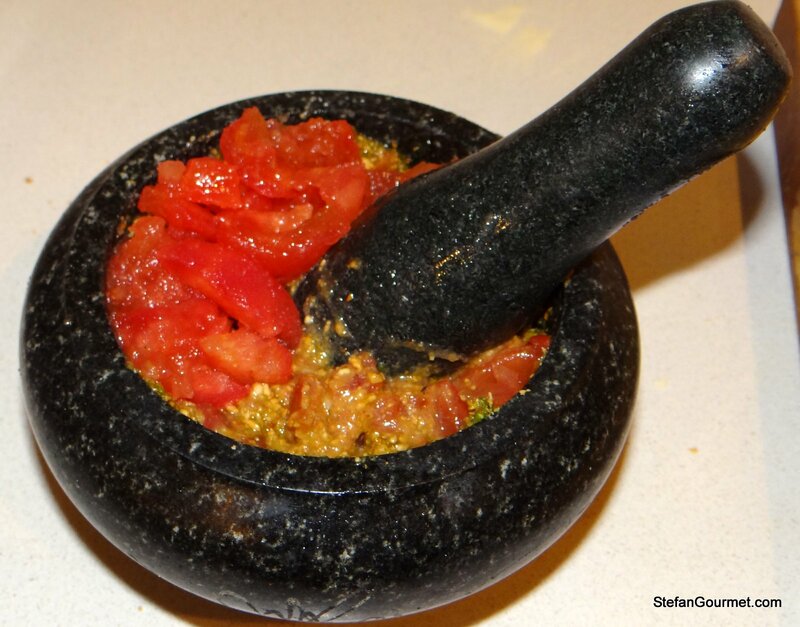 It is really great to see old-world cooking devices like the pestle & mortar share the same counter space as the modern-day food processor. You make dinner decisions a challenge–and that good! You are right that the mouthfeel and marriage of flavors is a great one in this, that’s what I liked about it when I had it for the first time at San Vito Lo Capo. I always wondered how you could get pasta with and without egg in it you would think the lack of egg would make it sort of fall to bits but I cant honestly say it makes much difference or am i just being a bit ignorant…. There are certainly differences between egg-based pasta and water-based pasta, as well as between 00-flour-based pasta and semolina-flour-based pasta. There are differences in both taste, texture, and surface. The differences in surface are important because a sauce will cling better to pasta with a rough surface. I do not really know how big the differences are, and that is a good topic for some side-by-side testing. Thanks for the inspiration! Looking delish as always. While on the subject of fresh pasta, any suggestions on how to prevent thin home made fresh pasta such as spaghetti from breaking when boiling? If fresh pasta breaks when boiling, it probably means you didn’t knead the dough long enough, or that you used the wrong type of flour. 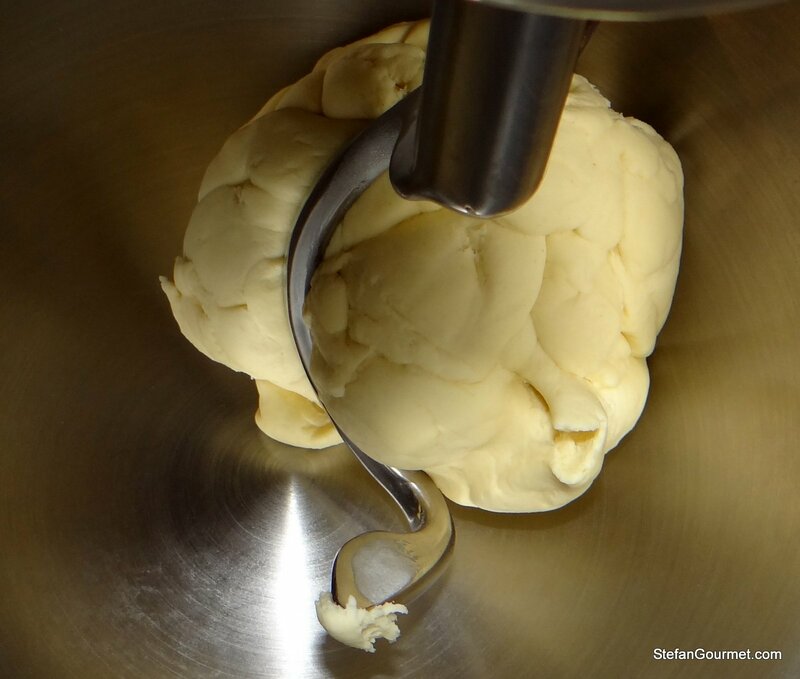 The dough should be smooth and elastic, which means that if you press your finger on it, it should slowly bounce back. 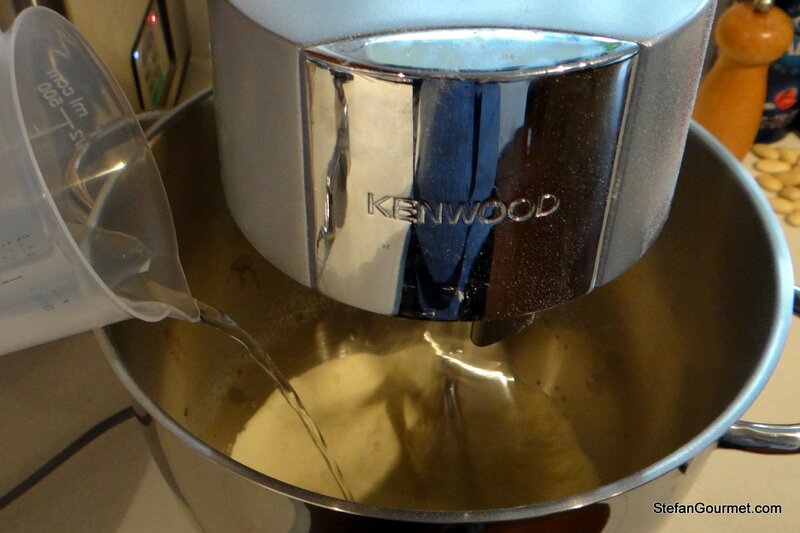 A stand mixer can work wonders in case you get fed up with kneading by hand too soon. Does this help? Thanks, it very well may. I’m 100% sure I kneaded the dough for long enough, so it must be the flour. You need flour with enough gluten. AP flour won’t work. Try semolina flour or Italian 00. Nice dish, Stefan, as always. I’m still too comfortably lazy to pound the pesto. 🙂 Great flavor profile and love the fresh pasta. Thanks Richard. In this case I don’t think it makes as big a difference as with basil pesto, but it is important not to make it too smooth. Stefan, You continuously amaze me. You are a pro, and if you are not already doing so, you would be a great cooking/chef instructor. I think I commented your the beautiful fresh pasta shape you were making. Didn’t even notice you’ve linked over to my old post on the sauce. However it’s made, I’m sure it’s delicious. 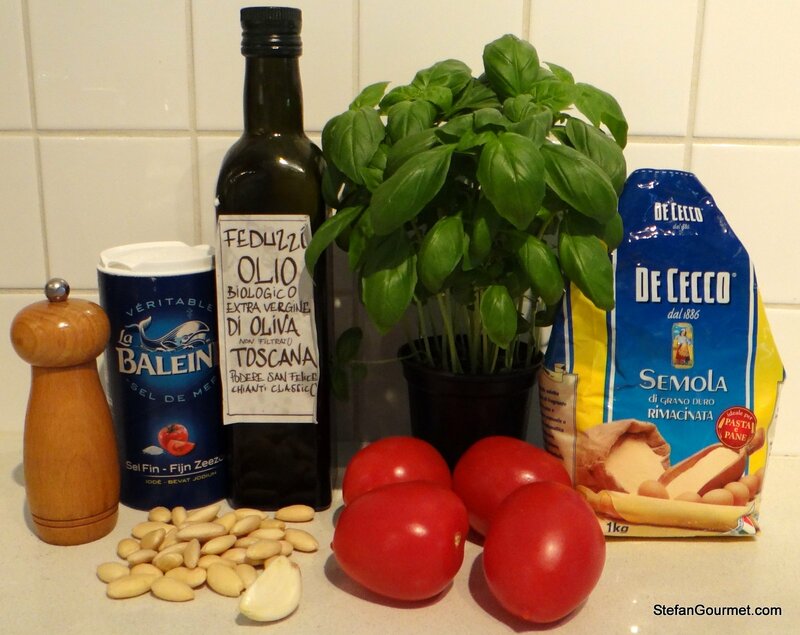 Stefan … I enjoyed some true “Busiate alla Trapanese” dishes this late summer in San Vito Lo Capo (Trapani) … and now – after reviewing your blog recipe – i had a falshback and felt in a deep depression …. I MISS BUSIATE ALLA TRA PANESE VERY MUCH!!!! Great, thanks for the nice compliment. 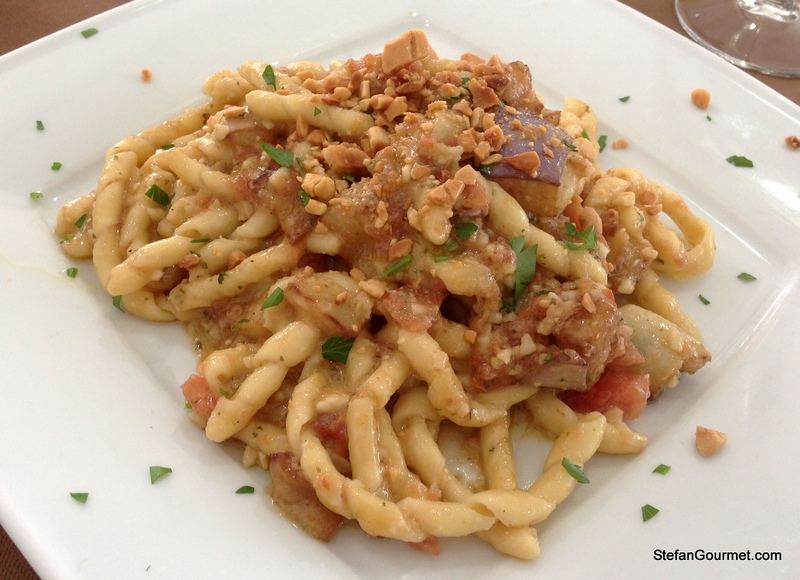 How nice that you also had busiate alla trapanese in San Vito Lo Capo, just like I had. Great recipe, thank you for sharing. You said you had left the eggplant out. Could you tell how it goes in as I would like to include it. I am mad about eggplants. Thanks! Thank you! Will try it very soon. Wow. My comment was from 2013! I’ve learned so much from then.